Photo: Good for tall people. Tall, large folk will certainly appreciate the spacious, high-ceiling rooms of Quynh Anh Hotel. It boasts clean, new, functional rooms with freshly painted walls, solid wood furniture and extras like minibar, flatscreen TV, mirror, table and chair. Two rooms at the front of the building have a private balcony. This hotel seems like a quiet place (we had to wake the owners up from a nap) which will suit those who want to lay low. The tile hot-water bathroom sparkles, with the added bonus of a sink with countertop. Rooms with two beds have a shared bedside table. Like most guesthouses in Con Dao, the mattresses are firm. You can’t go wrong with this solidly built modern hotel. Quynh Anh is located on a quiet street in the northern end of town – remember, the town is tiny and nothing is very far – but it does mean you are a few extra blocks from the water. This is really not a problem if you rent a bicycle or motorbike. 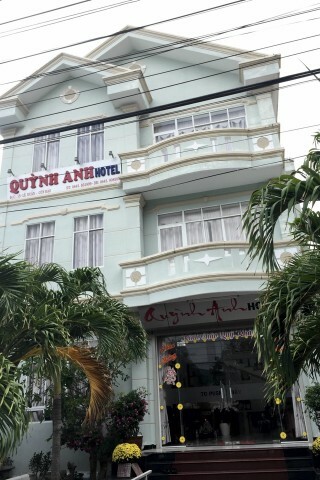 Check rates at Quynh Anh Hotel on Booking.com.